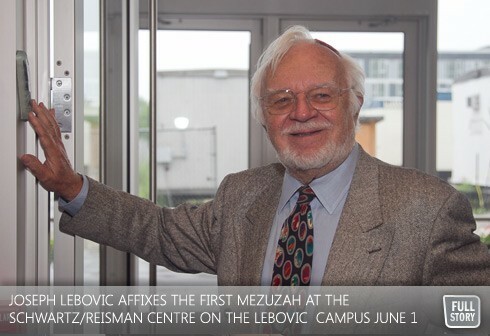 By Daniel Horowitz—A new chapter in the ongoing tale that is the transformation of the Jewish GTA was written on June 1st, as the Schwartz/Reisman Centre on York Region’s Joseph & Wolf Lebovic Jewish Community Campus opened its doors to the public for the first time, more than a decade after the dream began, and the new state-of-the-art centre of Jewish life did not disappoint. To show just how much this facility was needed for the flourishing Jewish community of over 60,000 living north of Steeles, individuals were lining up at 5:30am to make use of the facility on its first day of operation. Jacob Schwartz, a boy born with a debilitating neurodegenerative disease, and whose name graces the Jacob’s Ladder Therapeutic Pool is named after, took the inaugural dip into the pool in the Centre’s Randy Mark Stupp Aquatic Centre. There was not a dry eye in the house, and it wasn’t because they were all swimming, Well before the Schwartz/Reisman Centre’s June 1st soft opening, registration was at 40 percent above projections with over 2,100 members signed up and ready to go, demonstrating that the need for the programs and services provided by the Schwartz/Reisman Centre is stronger than ever. The Lebovic Campus location of the Jack & Pat Kay Centre Camp has already reached its original target of 250 campers, with sales still going strong. Meanwhile, the Gorman Shore Goodman Childhood Education Centre, which opens in September, is already 75 percent full. The Phil Granovsky Sports & Recreation Pavilion is home to the salt water Brown/Lederman Outdoor Pool and two indoor salt water pools, including the Jacob’s Ladder Therapeutic Pool. Truly an example of one-stop shopping for all your cultural, recreational and health needs, the Schwartz/Reisman Centre offers the Jack and Pat Kay Centre Camp, pre and afterschool programs, prenatal classes, Jewish learning, youth groups, art classes for all ages in partnership with the Koffler Centre of the Arts, dancing, bridge, computer classes, Hebrew lessons and so much more. “I was there, in the rain, when the Schwartz/Reisman Centre opened on June 1st, and me and my family, plans on taking advantage of this incredible place as often as possible,” said an enthusiastic Debra Starr, who along with her husband and four children, particulary enjoy the salt water pool. To view a video from the June 1st soft opening of the Schwartz/Reisman Centre, click here.